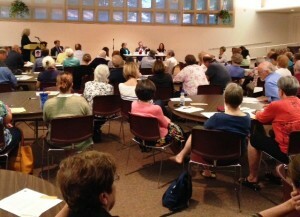 Over 85 people attended an OTOC “Conversation with OPPD Candidates” on Monday, September 8 at St. Pius X Parish Hall. Leaders of the new OTOC Environmental Sustainability Action team organized the meeting with candidates which attracted a group of leaders from diverse congregations across the metropolitan Omaha area. Candidates Tim Gay and Krystle Craig from District 3 representing Bellevue, Papillion and LaVista and Anne McGuire representing District 2 in Central Omaha participated in the meeting. All candidates in each of the 3 districts up for election this Fall were invited but the other candidates declined the invitation to attend.Read More . . .
OTOC was Urban Abbey’s community partner in September!! UA will contribute 10% of everything purchased at the coffee counter and 100% of every bag of coffee bought during September to OTOC to support our work. OTOC leader Carol Beaty worked with Action Team leaders to schedule this slate of lively discussions:Read More . . .
Housing Action Teams Chairs Gloria Austerberry and Karen McElroy and member Ian Fallon testified at the annual City of Omaha Budget hearing Tuesday evening. Fifteen OTOC leaders were present as Ian Fallon showed “before” and “after” pictures of a house in the 3000 block of Burt that had been a blight on the neighborhood for 5 years before it was demolished in 2013. He also showed photos of an abandoned fourplex on Turner Blvd, across the from the heavily used tennis courts at Dewey Park. The abandoned fourplex was demolished by the city in early August at a cost of $27,500 after the owner refused to take responsibility for his property. Karen McElroy returned to a proposal that the City Council create a Vacant Property ordinance requiring that owners register any property that has been left vacant over an established number of months. This would allow the City fire and police officers to know that there should be no activity in or around the building and helps prevent firemen from entering the structure if it is on fire. 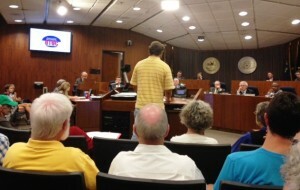 It is also a means to put pressure on the property owners to decide what they will do with property. Gloria Austerberry testified that the City of Omaha needs to adopt a policy of trying to recover the cost of demolishing abandoned structures from owners who have multiple properties that they have abandoned. Austerberry showed asked why the City of Omaha should be stuck paying $27,500 in public funds when the owner of that property owns several other apartment houses in the city. OTOC leaders have drafted and begun circulating a statement in support of children who are fleeing to our borders due to violence in their home countries. Now, in less than a week, over 150 leaders including 90 clergy, women religious or heads of faith based organizations have signed the statement of support. OTOC will work with our allies to continue circulating a statement of support for refugee youth in congregations and community organizations throughout the state so that our federal legislators understand that Nebraskans want the refugee children to be treated humanely and receive due process in our immigration courts.Read More . . .